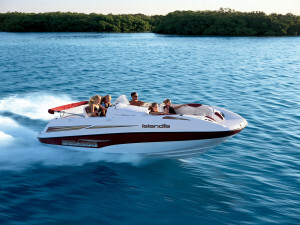 Now that you are an experienced boater, you will most likely enjoy sharing that enthusiasm with your family or friends. Whether taking along children or pets, below are some boating safety tips to protect you and your loved ones, including your furry friends. Provide Shade – Both animals and little ones will need refuge from the sun. If your boat has a cabin you’re set. If not, you will have to provide some shade for them. Try a small pop-up tent or umbrella. Protect Feet – The surfaces of boats can get very hot in the sun. Dogs absorb that heat through the pads on their feet. Cool down the surface before letting your pet on board or provide something for him to walk on like a piece of carpet. Children can also be more sensitive to that heat than adults, so don’t forget some comfy shoes for them. Drinking Water – Of course you will want to keep plenty of fresh water available for all of your guests, but don’t forget to provide it for the pets too. The motion of the boat may make it difficult to keep a water bowl full, so check it often. Potty – Before you board, walk your dog so he can relieve himself. Depending on the amenities of your boat, it may be a good idea to get everyone relief before taking off. Short Trips – To get both children and pets used to the movement of the boat, make the first few trips short or make frequent stops at shore for short rests. Life Jackets – Not all dogs can swim and some dogs tire easily, so you may want to provide them with a life jacket. Let them get used to it by taking them for a test run in the water before boarding the boat. To be effective, life jackets need to fit correctly. They should fit snugly and for children, have a crotch strap and also a collar to keep them face up in the water. Choose bright colors for visibility. You may want to attach a whistle and instruct them on sounding it in emergency situations. Learn to Swim – Knowing how to swim is important for water safety, but it is not a substitute for wearing life jackets in the boat. Teach your children that swimming in open water is different than in a pool. There are underwater hazards and there can be undertows even in still water. No diving, as you cannot be sure of the depth. Most recreational areas have designated areas for swimming for safety purposes. Rules – Specify the rules like no running and keeping hands and feet in the boat before embarking. Older children can benefit from a boating safety course. First Aid – For peace of mind in protecting your family, take a first aid course that includes CPR training. Don’t forget that the effects of hypothermia can occur more quickly for the young ones. Carbon Monoxide Alarm – Just like in your home, this can be a life saver on a motorized vessel. Alcohol – Coping with the pets and kids in the enclosed environment of a boat all day may drive you to drink, but be smart and wait until you are on dry ground.